Habit: Perennial herb, erect, 10--30 cm, coarse-hairy, base woody; dioecious. Leaf: in whorls of 4, in 2 unequal pairs; leaves of larger pair 6--19 mm, generally ovate to lanceolate, +- 3-veined, tip tapered to acute, generally sharp to touch. Inflorescence: narrow panicle, open, clusters axillary, many-flowered. Flower: corolla rotate, +- white to pink, hairy externally. Fruit: nutlets, 3--6 mm including long, straight hairs. Chromosomes: 2n=44. 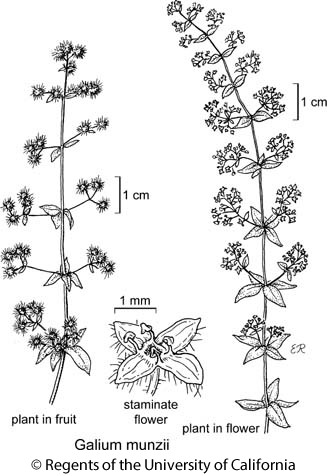 Citation for this treatment: Valerie Soza 2012, Galium munzii, in Jepson Flora Project (eds.) Jepson eFlora, http://ucjeps.berkeley.edu/eflora/eflora_display.php?tid=26377, accessed on April 19, 2019. No expert verified images found for Galium munzii.